Agricultural soil phosphorus levels held steady or trended downward in at least 80 percent of Ohio’s counties from 1993 through 2015, according to recent research by CFAES scientists. 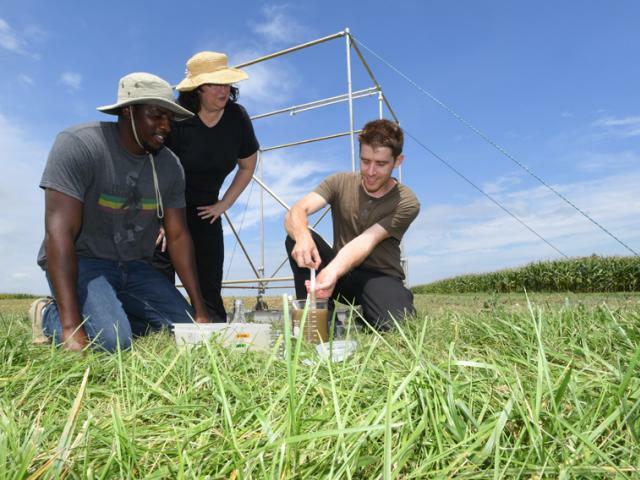 Their findings, which came through the college’s Field to Faucet initiative, represent good news for Ohioans concerned about protecting surface water quality while maintaining agricultural production, said CFAES scientists Elizabeth Dayton, Steve Culman and Anthony Fulford. The Field to Faucet effort includes researchers funded by OARDC. “Soil phosphorus levels are strongly related to runoff water phosphorus levels. Less phosphorus in the soil should result in reduced phosphorus runoff risk,” Dayton said. “These findings show that Ohio farmers are doing a good job of managing soil phosphorus levels. Phosphorus soil testing is an important tool for farmers. They use it to determine if phosphorus fertilizer is needed for crop growth, and if so, how much. In Ohio, research-based, crop-specific phosphorus fertilizer advice comes from the Tri-State Fertilizer Recommendations (go.osu.edu/Bawz). Phosphorus runoff from farm fields is one of the causes of the harmful algal blooms plaguing western Lake Erie and other water bodies. To contact the scientist: Elizabeth Dayton at dayton.15@osu.edu.